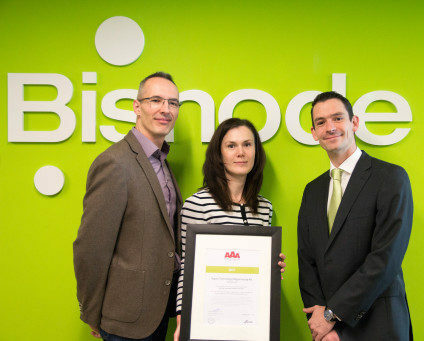 György Nagy, Agnes Konda, Sigma Technology, and József Keleti, Country Manager of Bisnode Hungary. The Bisnode international corporate rating evaluates financial stability and business reliability of enterprises. The rating is based on a system designed by international credit experts and has been used for rating companies since 1908. Bisnode certificates are well established in several countries across Europe. In the Nordic countries, they carry the weight of a credit rating system. Receiving this prestigious rank makes Sigma Technology Hungary one of just 0.63% (or 1 in 159) of Hungarian companies with a triple-A rating. It reflects our goal to ensure business reliability and quality of the services we provide to our customers. A further acknowledgment of our commitment to quality is our comprehensive set of ISO certifications. Sigma Technology was among the first few companies to receive the ISO 27001 certification, which proves that the company fully conforms to international information security standards. Sigma Technology offices in Sweden, Hungary, and China conduct regular external audits to verify that our management system conforms to three ISO standards: ISO 9001:2008 (Quality), ISO 14001:2004 (Environment), and ISO 27001:2013. For more information, contact György Nagy, gyorgy.nagy@sigmatechnology.se.